You can login with your email address and password. It's easy - first you Register	online and create a	personal password so that you can login with your email address. You can Login with your TOPS BonusPlus® number and last name. The website checks your login entry against the website database. It's simple. A one-time process is all that's needed to Register online for advanced website features. Enter your last name and card number, and the website will check your entry against the website database. You'll then be asked to create a personal password to use as a new method of logging-in. When you login, you can select "Save my login" to be automatically logged-in on return visits from your computer. This feature uses web "cookies" to store your login name and card number. Web cookies are small records created automatically by the web browser you use such as Internet Explorer, AOL, Firefox, Safari or Netscape. Web cookies are stored in a special file on your computer's hard drive. The cookies can then be retrieved by only the Tops website server. By storing your login data as a cookie, your computer will automatically log you in to the Tops website for access to advanced features. 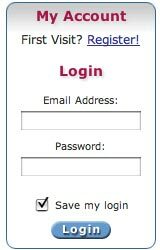 Note that if you login on a public computer, you should not select "Save my login" so that the computer will not automatically log you in. Once you've logged-in, you can Logout at any time. This is recommended whenever you are using a public or shared computer. After you've logged-in, you can easily Update your personal Profile online. The pages are secured via encryption for protection of your contact information.